One of the many good things about dried pasta is that it offers something for everybody. With an almost endless variety of shapes and styles, a pasta aficionado can quickly amass quite a collection. When it comes time to reach into the pantry and cook up a batch, chances are choosing can become a difficult decision—especially considering everyone has their own personal faves. But there is a way for everyone to have the pasta they want without boiling pot after pot of water. 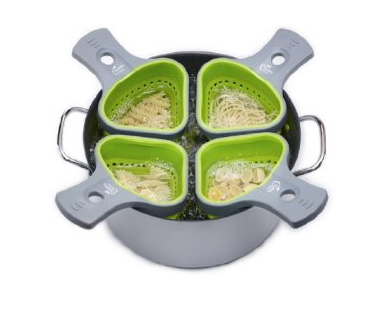 The Jokari 229476 Healthy Steps Pasta Portion Basket is part of a set that allows for up to four individual servings of pasta to be prepared in one cooking vessel. The cooking baskets rest on the edge of a pot, allowing pasta of any type to cook undisturbed. Spaghetti and macaroni at the same time? No problem—just lift out your pasta basket when done. As for the sauce… well, for that you’re on your own.